This is one of the "Little Ones" Birthday Dolls collection. Each "Little Ones" Birthday Dolls depicts a girl at a certain age. Perfect birthday gift for girls age 1 through 18. 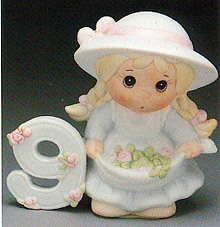 This age 9 doll stands at 3" tall. This Double Heart Plaque makes a great wall decoration. It has dimension of 6-1/2".